Amidst the handful of sounds rising with the dawn – roosters, dogs, bikes, metal shutters – lies one so unique, now so familiar, that it provides an essential melodic counterpoint to the rest. Some mornings, I almost imagine it to be the main soundtrack accompanying every sunrise on this island. Not quite as endearing as h earing a baby’s whimper, nor as sweet as the meowing emitted by the black cat that saunters silently along the rooftop outside my window. No, it’s much simpler, much baser than that; the sound of sweeping. Not exactly sweeping, mind you; it’s more like whisking. 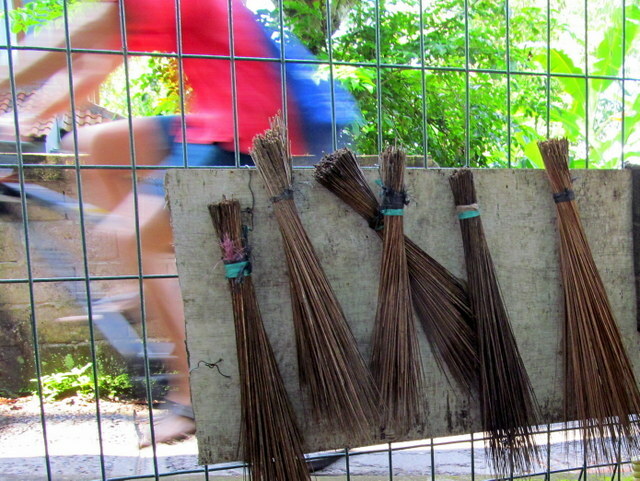 Fashioned from a bundle of coconut leaf reeds, primitively tied together with string, most of these brooms are handle-less, thereby requiring the user to bend from the waist. It’s an essential staple of every Balinese household, compound, warung, office, bu siness and temple. 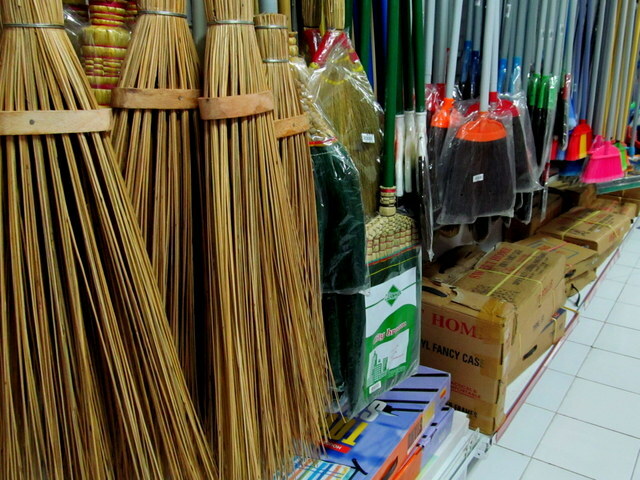 A supermarket’s collection of brooms.. most with handles!
. 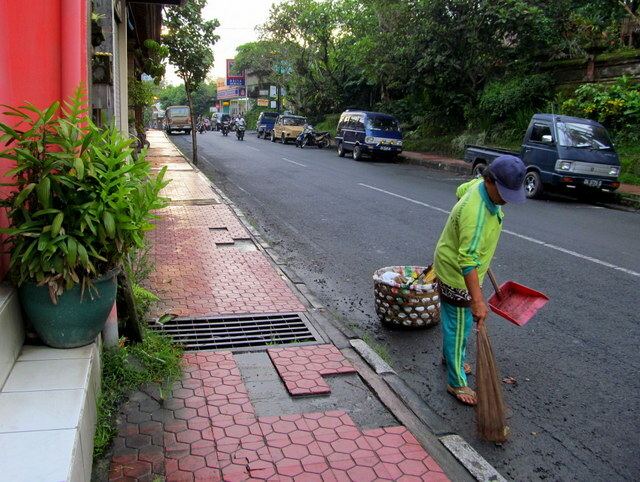 I recently asked a Balinese friend (who admits to being more Western by now, married as she is to an American, and well-traveled) about the curious nature of the sweeping cycle. I wondered how someone who has just taken the time and energy to sweep up the entire frontage of their compound, to the point of utter spotlessness, can just moments later, emerge from the house with an emptied boxed drink or crinkled foil wrapper and dump it on the same ground. The answer might surprise you, but with months’ worth of compassion and (a gargantuan attempt at) understanding behind me, I can better appreciate the disconnect: generations of women have prepared food, drink and offerings that originated in nature – and could easily be disposed of, and recycled into, nature. The fact that the Balinese continue with the same thoughtle ss motions reflects a lack of understanding and, possibly, a genetic disposition to carry on the same way as their ancestors did. Sure enough, and I don’t discount this, laziness (my friend A concurs) is a HUGE factor as well. 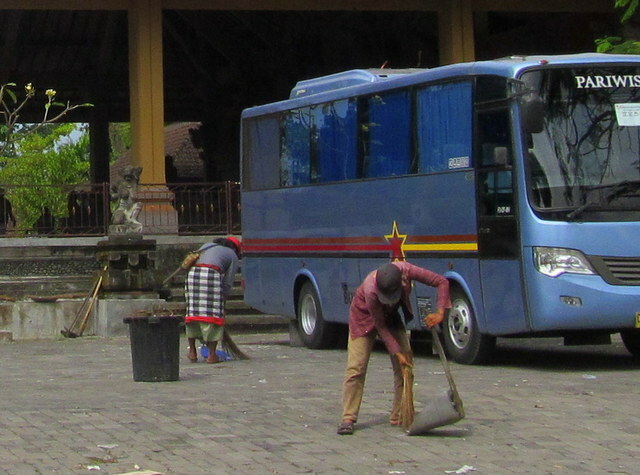 Once in awhile, I see packs of uniformed students riding pillion without a backpack in sight, but carrying that ubiquitous Balinese staple: a handle-less broom. They’re headed to school on a day when they’ll spend considerable time sweeping the grounds – of school, the sidewalks outside, possibly the templ e(s) nearby. Then again, as I’ve witnessed time and again, this activity merely gives the kids an excuse to dawdle outside school, hang out and gossip with friends on street corners, far from the watchful eyes of their teachers. Arguably, sweeping has a deeply meditative dimension. These women, the vendors, the street cleaners, they follow the same motion every morning without fail. Who knows what thoughts, prayers or worries permeate their minds at those moments? But the daily sight of scattered offerings still on the ground from last night – and whatever was not yet picked at by roosters, chickens and dogs – is proof enough that the spirits have been frightened off. That in itself must be a balm to the Balinese female psyche; their offerings have cleansed the environment of evil spirits and now can be safely swept away into oblivion (or so they believe). My friend A says they simply sweep because that is what their mothers have done, and their grandmothers before. For the most part, they do not live an examined life; they do what’s been done before, mostly without questioning. I love hearing and watching the sweeping too. Even as I write, Mrs Bu is going around the apartment with her beloved sapi, whisking up bits of fluff and peanuts shells and all the filth that seems to gather. When she’s finished doing that she’ll then use another sapi for beating the bed and the furniture. I’m fascinated by this too – she uses the broom to sweep the bed and the sheets and hit the pillows! She must think that Pete and I are the most terrible slatterns. In Bali I keep the sapi to hand to guard against Mr Ratty and Mr Shrewbury who are becoming a little too over-familiar for my liking! Oh ya, itu sapi! Lupa namanya 😉 There’s some kind of magic that happens.. and weirdness when they use the same sapi on beds, tables, dishes – and floors. Aduh! They used the same sapi (cow) on the same beds, tables and floors? Beautifully written. I love the sound of sweeping. It is a sound I associate with Africa, seeing that I have never been to Bali, but I guess it will make me feel completely at home there. Thanks, yes there’s something almost hypnotizing (dare I say sleep-inducing?) about that sound. I’m sure there are many similarities between developing tropical cultures. I will never forget waking up in Bali that first morning to the scratchy sound. I was first mystified, then delighted as I discovered what produced it. Now, like roosters, ducks, doves, and distant chanting, it has become synonymous with morning for me. indeed a plethora of sounds 😉 Sorry I missed strolling with you this morning! I’ve been away from Bali for 2 months now and still hear the sweeping in my head, now associated with symbolic, trance-like cleansing on all levels – physical, mental, emotional, spiritual. 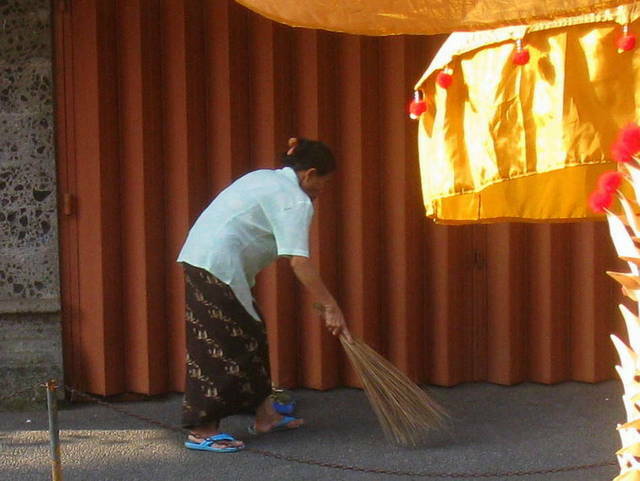 I am grateful for the metaphor and the Balinese who have the daily practice of sweeping. Hi Amit- I really enjoyed this post: it really is a background sound that permeates all of Asia. It’s often the sound that wakes me in the morning………. or tells me it’s 6pm….get up from my nap/rest. Meanwhile another reason to bring back the “banana leaf ” receptacle/precursor of the plastic bag! When i hear the incessant soundtrack of “weed wackers” I know I am in california (only to be held by Mexican gardeners). it was the first sound + sight that greeted me in San Francisco .